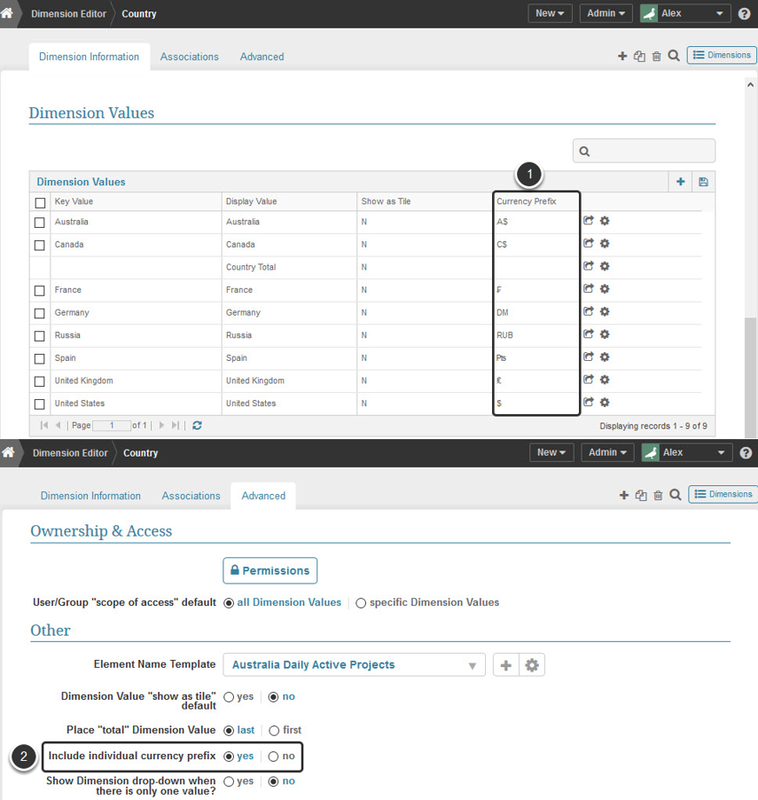 Selection of the appropriate 'default' Display Mask for data collected/uploaded for Metrics and Reports is initially determined by Metric Insights by analyzing the content of the input data elements rather than requiring you to specify a mask explicitly for every numeric data element. The default Display Mask for your numeric fields is based on its analysis of various initial settings. This process prevents your being required to choose a mask for each new element. You can change the defaulted Display Mask at anytime from the element's Editor by choosing another mask, either by using the Override Display Mask option on the Metric Editor or in the Format column on the Report Editor, both explained below. If you have set an explicit Display Mask for the column/value, it is utilized. Show any number => 100 without any precision; e.g., Instead of '$123.45K', always show '$123K' since having precision in decimal points when the base number is > 100 is not very meaningful and forces the font to be smaller than it needs to be. Show numbers < 10 with at least 1 decimal point of precision (i.e., 8 instead of 8.2). If 2 decimal points can be included, show with decimal points. If it is not possible to display with at least 1 decimal point precision and meet minimum font size requirements, numbers are not displayed above the chart at all (for any bars in the chart). For values less than 10, dispalying at least one decimal point of precision is preferred. Display numbers < 5 with at least 2 decimal points of precision; e.g., 3.22. If this can not be done while meeting minimum font size requirements, numbers are not displayed above any bars in the chart. 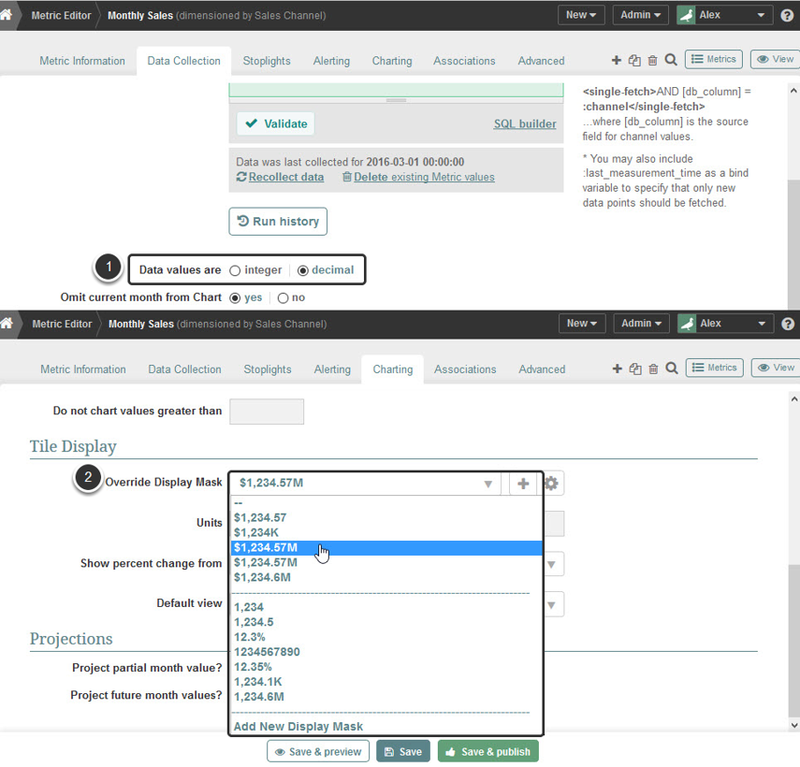 If an element typically contains larger values, choose a mask that aggregates data by thousands or millions in order to enhance readability of a value's display on a tile and in the Full Chart view. In the Report Columns grid if you do not change the system-set Format, 'Default' is displayed in this column. 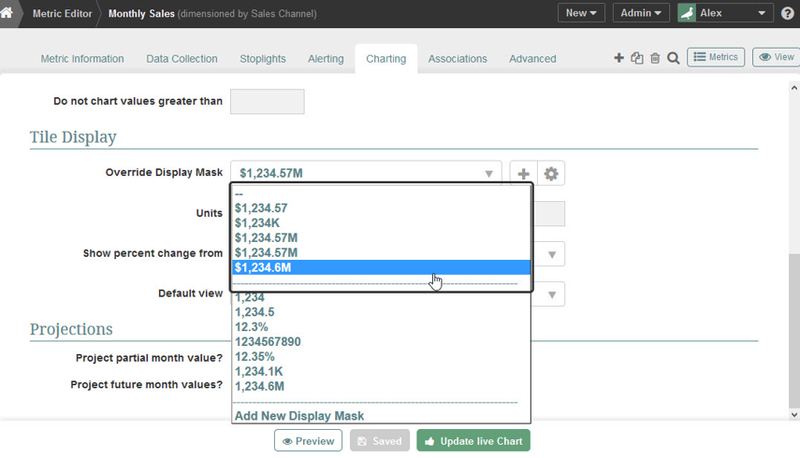 Click the corresponding row of the Format column to open a drop-down list allowing you to select any available Display Mask (as shown in the 'units' row). You may indicate whether the value in this column should have a currency symbol by checking the box in the Currency? column and selecting any Display Format in the Format columN. NOTE: If you clear the checkbox in the Currency? 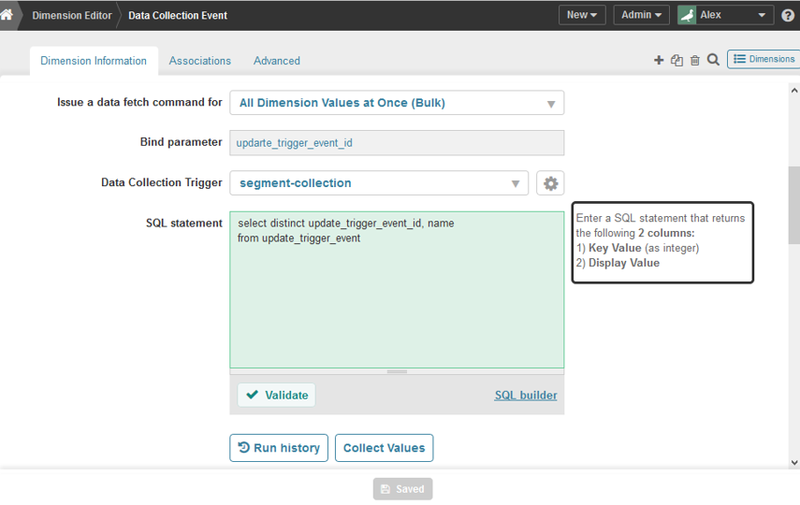 column, the setting in the Format column automatically automatically becomes 'Default'. If no symbol is specified for the Dimension Value, the config file entry is used. See Default Name/Description Values for Elements. Prev: Why don't my Element tiles, tables and charts have a currency symbol?